Name: Black Ant, Lasius niger. Egg: Eggs are white, tiny and kidney shaped with a smooth sticky surface allowing the eggs to be carried in bundles. Larvae: Legless grubs which are fed by mature ants. Become adult in 3 weeks. Pupa: Pupation takes 2 weeks, pupa are usually mistaken for ‘ant eggs’. Adult: Workers – 3-5mm long, dark brown/black. Drone – Produced only leading up to the queens mating flight. They are 5-7mm long with delicate wings. Queen – Can grow to lengths of 9-12mm, can live for several years. Workers are the most commonly seen caste member. They are 3-5mm long and dark brown to black. They are extremely active and agile insects, able to transverse vertical surfaces in the search for food. Food stuffs range from foraged seeds, to honeydew from aphid secretions. The colony is monogynous (having a single queen) and on average can reach sizes of 4000-7000 individuals. Widely distributed through Britain. Frequently close to, and in association with human dwellings. They create their nests outside underground in almost any location which will allow them to burrow, but they show a preference for sandy soils, making paved patios a prime target. 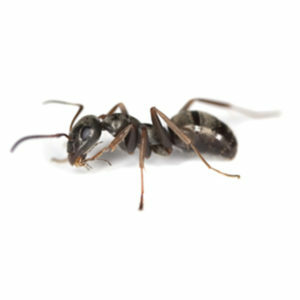 The clearest sign of infestation is witnessing worker ants in or around the property. Closer inspection and backtracking the ant trail will reveal the points of ingress into the property, and the entrances to the nest which are usually small holes in the ground no bigger than 5-6mm. 1. The British Pest Management Manual. Section 5, pg 176.